Writer Carole T. Beers is a descendant of Oregon Trail pioneers, who worked as a reporter and dance critic for the Seattle Times newspaper, where she won several awards and interview such celebrities such as Katharine Hepburn, John Wayne, Clayton Moore, B.B. King, and Rudolph Nureyev. She has a life-long love of writing and riding, and got her first horse and her first author autograph at eleven. After earning a B.A. in Journalism at University of Washington, she taught writing at a private school, wrote for romance and horse magazines, such as Modern Romance and Western Horseman, and began her career as reporter. 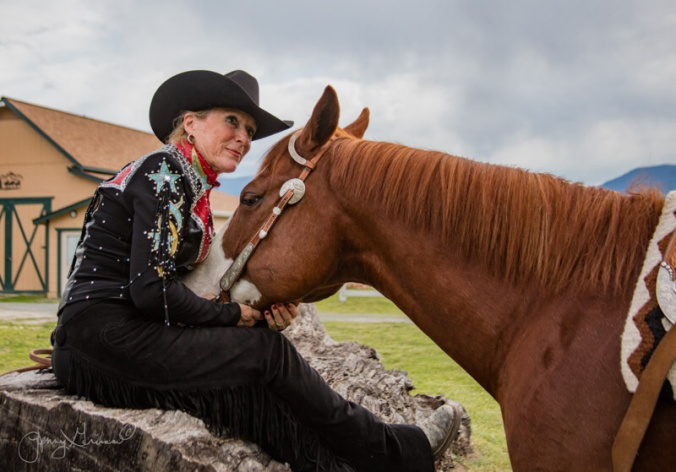 She also received a number of awards as horsewoman, including the 2012 American Paint Horse Association’s National Honor Roll Championship in Amateur Walk-Trot Horsemanship and Trail, and Reserve National Championship in Amateur Walk-Trot Western Pleasure. Today Carole T. Beers still rides and writes. She pens mystery and adventure books and stories for adults and teens and her book Saddle Tramps combines two sassy women, show horses and crimes. She has also written a forthcoming novella, The Stone Horse, inspired by Zuni carvings of spirit animals, contributed to the collaborative mystery novel, Naked Came the Rogue, and has several projects in the works. We talked about her recently released Saddle Tramps. EB: Tell us about Saddle Tramps. CTB: The book is a fast and fun read set in the high-stakes western horse-show world — a world seldom if ever explored in fiction. In many ways it speaks of a New American West, where old traditions such as courage, honor, and connections to horses and the land are challenged by new yet strangely familiar crimes and passions. Retired reporter, Pepper Kane, aided by her Lakota-policeman lover, Sonny Chief, and her horsey buddies, tracks down the killer of a valuable stallion. And yes, there’s a gunfight at the end! EB: Saddle Tramps is kind of a western but set in modern Gold Hill. How did you choose the setting and time period? CTB: I write what I know. Both from my own heritage and history, but also what’s happening now. I wanted readers to experience some of the pride and other emotions I carry for the New West, which for me is in Oregon, Washington and California. And of course to learn something of this area — mainly the Rogue River Valley, first chronicled in Zane Grey novels of nearly a century ago. Tiny Gold Hill, where our heroine lives, is where in 1850 a five-pound nugget was found, launching the Oregon Gold Rush a year after the famous rush in California. I lived in Gold Hill once. The region is breathtakingly beautiful and truly Western flavored! EB: You kill a horse at the very beginning. Did you worry that readers might be upset? CTB: A bit. But I wanted to start the story with a bang, show its horse centeredness in a subdued yet compellng way, and then quickly get on with the crime-solving without offing a human. I’ve worked up to killing people in my present writing projects. EB: I was fascinated with the description of the showhorse culture. Which characters were the most fun to write? CTB: The heroine, naturally, but also her elusive but devilishly handsome lover, Sonny Chief. He is a traditional Lakota man, but also moves well through the modern world. Pepper’s buddies, such as her sassy best friend and dramatically inclined hairdresser, Freddie Uffenpinscher, additionally got me up and writing happy. Ditto that self-important, grizzly-bear sheriff who harasses Pepper for messing with his investigation! EB: Pepper Kane is horsewoman and former journalist and so are you. Are you like Pepper? CTB: There are several things an author and a lady shouldn’t tell (but sometimes does): Her age, how the book ends, and the names of real people who inspired certain characters. However, as I cannot sue myself. I confess that she and I share many qualities — with her name and some details changed to protect the guilty. EB: You were also an award-winning journalist with the Seattle Times. What were some of the highlights of that experience? CTB: Talking with and digging up facts about all manner of people, dead or alive, still stand as a cumulative highlight of my nearly forty-year newspaper career. I wrote news about lawbreakers and lawmakers. But mainly I wrote features, reviews and profile obituaries. I still feel privileged to have known leaders in the arts, business, politics, science, education and spiritual ways, as well as cowboys, cooks, test pilots, farmers, loggers, housewives and the homeless, I covered visits by Queen Elizabeth and Presidents George H.W. Bush and Bill Clinton as well as by arts luminaries such as John Wayne, Katharine Hepburn, Cary Grant, Peggy Lee, B.B. King, Frank Sinatra, Jr. and writer J.A. Jance. It is not so much the news from Microsoft, Boeing or the City of Seattle that I remember, but the people, and their sharing of deep and fascinating stories. EB: How has your work as a journalist informed your fiction writing? CTB: I am not satisfied with presenting sketchy stories, settings or personalities. I am driven to go long, go deep, and bring out the hidden quirk or fact. Then deliver it with flow, cleanly and compellingly to readers. Make it so I’d want to read it. If I don’t care, why should they? EB: You were also the dance critic, so I need to ask you this. How is dance like horse riding? CTB: Both require centeredness, in-the-moment yet forward focus, ever-changing balance, an ability to isolate and use different muscle groups, attunement to one’s terrain (stage) and co-performer. In ballet, as in show riding, one is pulled up and out looking, yet oddly relaxed, Moving with purpose, conviction. Yes, I am a dancer. With a thousand-pound partner who speaks no English! EB: What are you working on currently? CTB: You mean besides marketing myself and Saddle Tramps? I recall you said one of your interview subjects said he was too busy being an author, to write! I am beginning to write a second Pepper Kane mystery, tentatively titled Final Cut, about the mysterious death of a leading horse judge at a world championship show in Texas. I’m also doing a rewrite of a young-adult novel, Hannah and the Mustangs, and readying several short stories for publication in short-story eZines. EB: Tell us a little about your writing process. CTB: Ideas and writing directions bubble in my brain just about 24/7. Sometimes I deal with them consciously, sometimes not. But when an idea for a character or situation keeps returning, I will jot a note. Mainly I write a bit every day, usually in the morning, when I and the day are fresh. From one to four hours, depending how it’s going. My best writing times are when the plot or character is at a critical point. Then I have to sit there tapping keys until it’s all resolved. The best inspiration, aside from reading authors you like, is write what YOU like! CTB: It was a great interview, Ed. Your questions cut to the heart of what we do, and make us think constructively about what we do. So we can maybe do it better. 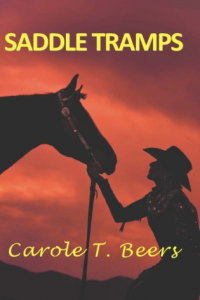 Carole T. Beers’s Saddle Tramps is available at Bloomsbury Books in Ashland, Oregon, and in print and eReader formats online.